What a picturesque ecard! If everyone had this view outside of their front window, the world would be a better place. Rays of sunshine flow down through the gapping trees to land on beautiful auburn soil and a still stream. The colours in this picture give it an extra punch and it becomes impossible to not stop and look at it for a while. 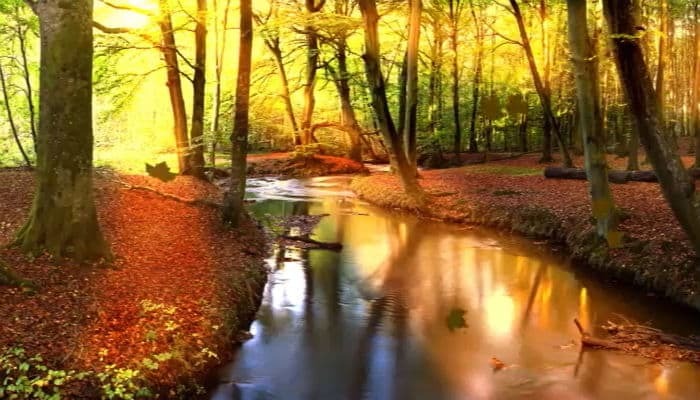 The scene is calming and relaxing and clearly it is an autumn month. The true beauty of these corporate ecards is that it can be used for any business occasion and each of the recipients will be thrilled by it. As autumn approaches, why not consider the ecards as a Thanksgiving e greeting. Not only is the picture appropriate but the scene it depicts is one everyone should be thankful for; to take time out at this autumn stream is an idea we can only dream of during the working day. You can personalise your message using any of these ecards and deliver it to the recipient with the hassle of having to hand mail it. There are many more designs to choose from, so take your time browsing through the website. You will notice that we with such a large portfolio we are the leading electronic Christmas cards for business so be sure to stop by when Christmas time arrives.